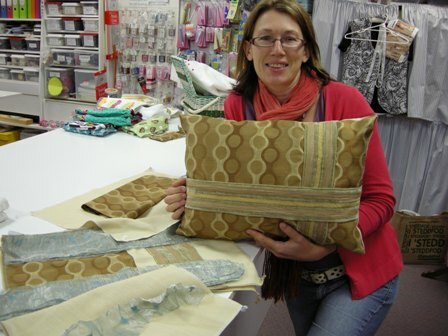 I just love seeing the final results of what my sewing students make in class with me at Rosewood Cottage. Here are just a few I have put together on this blog post to share with you today! 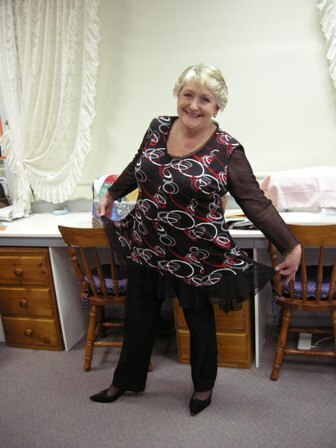 As you can see Margaret (below) is very pleased wearing her black trousers which were made from a Burda pattern. They feature a high waist and eight gold buttons on the front panel. Well done Margaret! 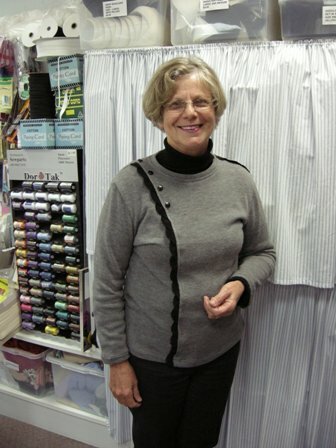 Shirley (below) came to class one day with a grey knit fabric and wanted to make a top but had no idea which pattern or style. So this gave us a fun challenge! What we decided to do was to re-design a basic t-shirt and create an off centre panel. 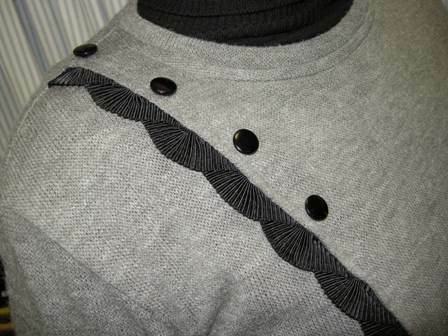 Shirley stitched a shell trim into the seam and added some black buttons. 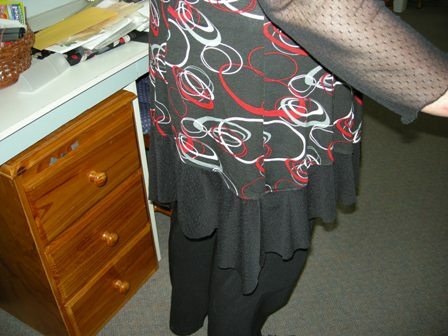 Then to balance out the design Shirley stitched the shell trim into the opposite shoulder seam. 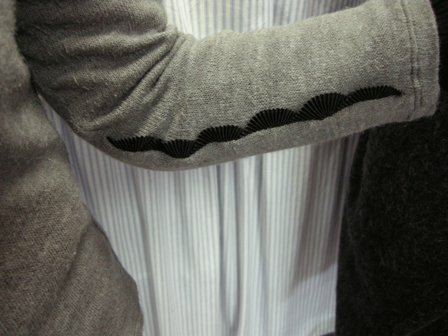 With the piece of trim left over Shirley decided the perfect place was to add it into the sleeve! 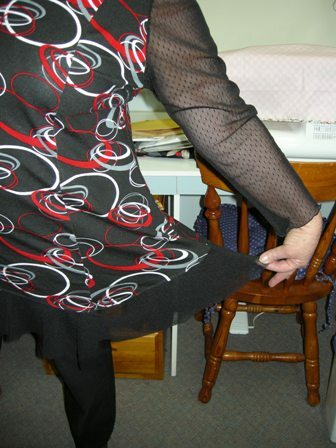 Shirley finished the hemlines with a stretch twin needle. 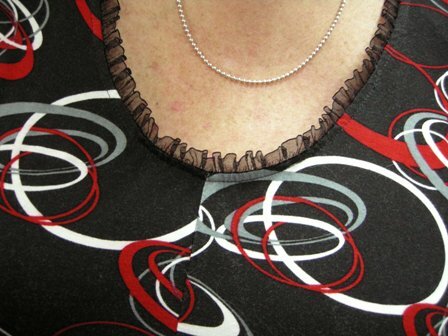 Shirley loves this top that she created and it always attracts lots of admiring comments! Great job Shirley! 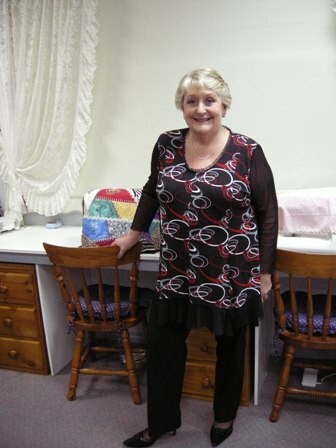 Julie (below) made this gorgeous top for herself which is made from a printed jersey knit for the body and lace netting for the sleeves and hemline. Julie finished the edges using the rolled edge on the overlocker. 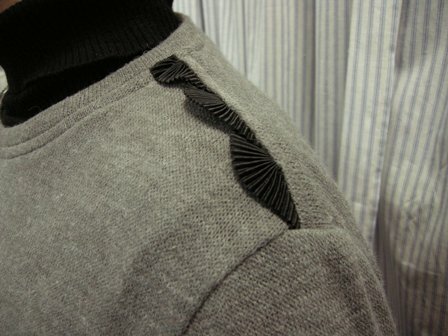 She also finished the neckline with a frilled edge elastic which both stabilised the neckline and gave it a soft finish. 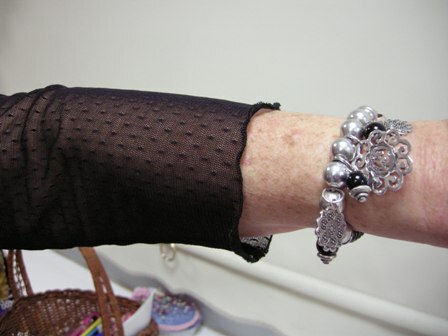 See below how Julie teamed her top with black trousers and shoes and accessorised with her jewellery! Fiona (below) bought some coordinating fabrics to match her chaise lounge. 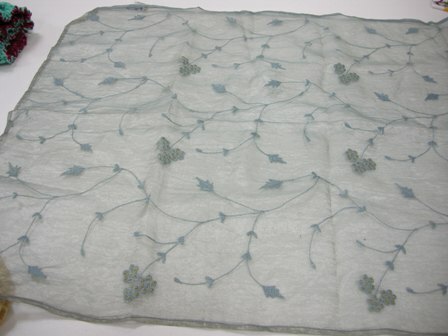 She also included a blue silk organza wrap which she cut to make handmade roses. 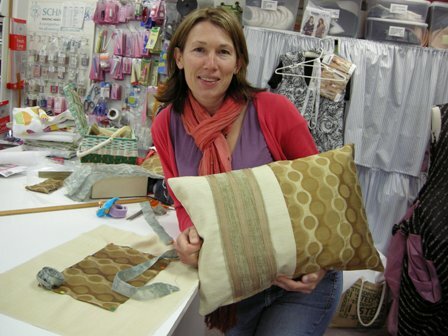 Fiona made a set of cushions which perfectly matched her decor. Two of her cushions are shown below. 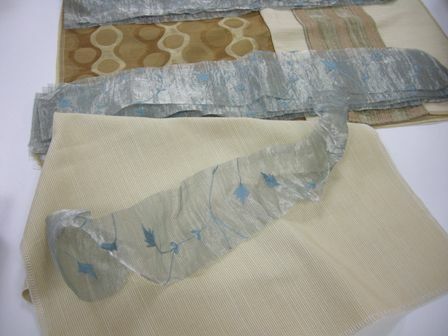 Fiona just loves to be creative by re-cutting and re-cycling as she did with this silk wrap – Well Done Fiona! If you have been inspired to sew from one of the sewing projects above, perhaps you have made something similar or would like share a comment on these projects below we would love to hear from you!